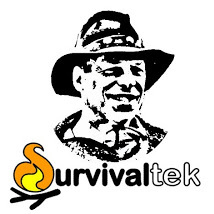 Although when the word “survival” is mentioned most folks associate it with wilderness but survival spans many situations including urban power outages. This was the context of the program where I spoke at the Wilkes County Library. It was an open discussion on survival techniques needed to deal with everyday life if the power grid should shut down. After introductions I initially spoke on the scenario of a local power outage and how it could effect living conditions. I suggested helpful equipment and associated provisions that the audience could acquire in preparation for such an event. I also brought samples of improvised tools like a can that was turned into a pot for cooking or for purifying water. 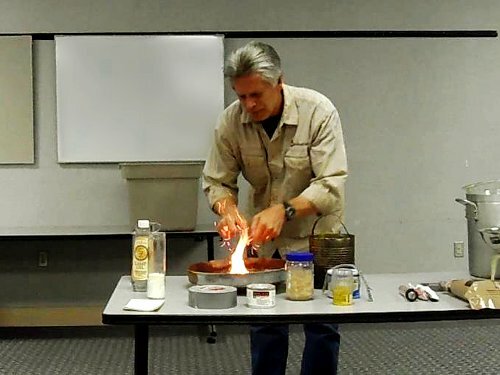 And, of course, what would one of my events be without some type of “fire”, so I demonstrated how an empty flintwheel lighter could be used to make a fire as well. One of the things that I enjoy about these events is that I get to meet new folks and I often learn things from their experiences and so we have a great exchange of knowledge and ideas. Part of this event was open for discussion and we were enriched because of it. This entry was tagged Event, Grid, Library, Survival, Urban. Bookmark the permalink.